Invite The Backyardigans to your party. This Backyardigans Jumper is the perfect choice for your Backyardigans theme party. 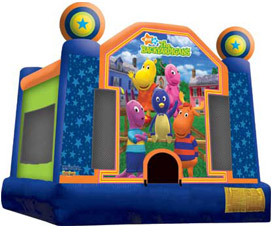 We from BounceHousesForRent.com will provide you with this new and clean The Backyardigans Theme Jumper. Our price includes delivery, setup, and pickup within our delivery area. We serve parts of Los Angeles County and Orange County, California. Jumper was a great find since the theme was hard to find. Good price. Courteous. Veryh clean jumper. Will definitely use again already recommended to a friend!! !